FOX has moved their successful Bones series to Monday nights this season. Up against some even bigger competition, will the TV show still come out a ratings winner — or could it be in danger of being cancelled? We shall see. This season’s cast includes David Boreanaz, Emily Deschanel, John Francis Daley, Michaela Conlin, Tamara Taylor, and TJ Thyne. The eighth season of Bones typically airs Monday nights at 8pm on the FOX network. There are 24 episodes. Below are the TV show’s ratings for the 2012-13 season, the best way to tell if Bones is going to be cancelled or renewed for a ninth season. Final season averages: 2.1 rating in the 18-49 demographic with 7.75 million total viewers. 2.1 in the demo (+5% change) with 7.36 million (+4% change). Season averages: 2.14 in the demo with 7.75 million. 2.0 in the demo (+5% change) with 7.06 million (+8% change). Season averages: 2.14 in the demo with 7.77 million. 1.9 in the demo (-5% change) with 6.56 million (-7% change). Season averages: 2.15 in the demo with 7.80 million. 2.0 in the demo (+5% change) with 7.05 million (+1% change). Season averages: 2.16 in the demo with 7.86 million. 1.9 in the demo (-10% change) with 6.96 million (-8% change). Season averages: 2.17 in the demo with 7.90 million. 2.1 in the demo (-5% change) with 7.58 million (-10% change). Season averages: 2.18 in the demo with 7.95 million. 2.2 in the demo (-4% change) with 8.41 million (-4% change). Season averages: 2.18 in the demo with 7.97 million. 2.3 in the demo (+5% change) with 8.77 million (+4% change). 2.2 in the demo (0% change) with 8.47 million (-4% change). 2.2 in the demo (-8% change) with 8.82 million (-3% change). Season averages: 2.17 in the demo with 7.86 million. 2.4 in the demo (-8% change) with 9.06 million (-2% change). Season averages: 2.17 in the demo with 7.79 million. 2.6 in the demo (+13% change) with 9.25 million (+8% change). Season averages: 2.15 in the demo with 7.69 million. 2.3 in the demo (+10% change) with 8.53 million (+10% change). Season averages: 2.12 in the demo with 7.56 million. 2.1 in the demo (0% change) with 7.79 million (-3% change). Season averages: 2.10 in the demo with 7.48 million. 2.1 in the demo (+11% change) with 8.04 million (+10% change). Season averages: 2.10 in the demo with 7.14 million. UPDATE: Bones has been renewed for a ninth season on FOX. 1.9 in the demo (-21% change) with 7.29 million (-8% change). Season averages: 2.10 in the demo with 7.38 million. 2.4 in the demo (+20% change) with 7.96 million (+12% change). Season averages: 2.13 in the demo with 7.39 million. 2.0 in the demo (+5% change) with 7.11 million (+2% change). Season averages: 2.09 in the demo with 7.31 million. 1.9 in the demo (-5% change) with 6.96 million (-5% change). Season averages: 2.10 in the demo with 7.34 million. 2.0 in the demo (0% change) with 7.30 million (+1% change). Season averages: 2.14 in the demo with 7.42 million. 2.0 in the demo (-5% change) with 7.20 million (+3% change). Season averages: 2.17 in the demo with 7.45 million. 2.1 in the demo (-9% change) with 6.99 million (-8% change). Season averages: 2.23 in the demo with 7.53 million. 2.3 in the demo (0% change) with 7.61 million (-5% change). Season averages: 2.30 in the demo with 7.79 million. 2.3 in the 18-49 demographic with 7.98 million total viewers. Season average: 2.30 in the demo with 7.98 million. Opposite some stiff competition from NBC, it wasn’t an impressive start to the season. Compared to the seventh season opener, Bones was down by 30% in the demo (vs a 3.3 rating) and down by 20% in viewership (vs 10 million). It’s worth noting however that last season’s debut followed The X Factor and this year’s opened the night. Still, compared to the sixth season premiere, Bones was down by 15% in the demo and by 19% in viewers. Reference point: The 2011-12 (seventh) season averaged a 2.4 rating in the 18-49 demographic and 8.07 million viewers. What do you think? 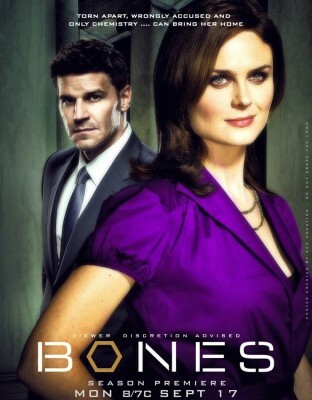 Do you still like the Bones TV series? Do you think it should be cancelled or renewed for a ninth season? Please renew Bones because the show always has a great story line. I love the actors in the show because they make you believe in the characters they portray. Please don’t lose this great show that shows justice can be found. Please renew Bones!!! I look forward to seeing it every week. The show should be Renewed. It is a great show and very one keeps your interest until the very end. Please renew the show. Love the show just finished season 1 and can’t wait to watch the next 7. Keep it going!!! After the horrible season finale in which they sacrificed the consistency of their characters for a stupid cliff-hanger that has many fans angry, I expect to see this one tank next season. It should totally come back for at least 2 more seasons! I love BONES and it is one of my favorite tv shows.